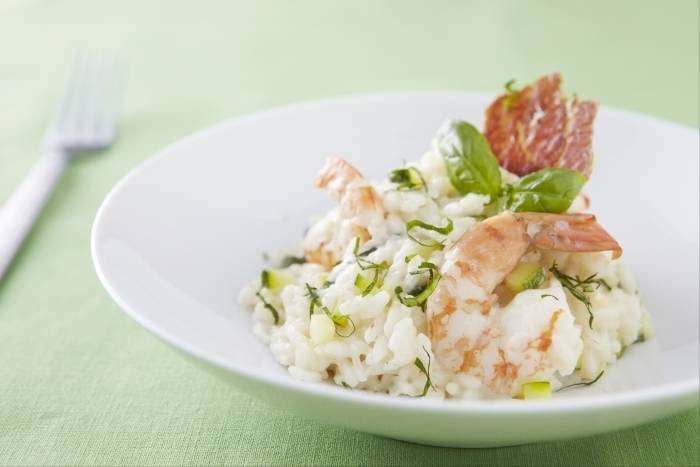 A classic Italian risotto with a difference; the combination of flavours creates a perfect dish, ideal for cooking for the family or to impress your guests. Place the pancetta onto a baking tray lined with greaseproof paper and cook in the oven for 10 minutes until crispy. Peel the prawns by removing the heads and then peeling away the shells. Then make a small incision along the back of each prawn and remove the vein. Keep the heads for the stock. Finely dice the shallot and garlic and cut the courgette into small cubes. Shred the basil and grate the parmesan cheese. Cut the butter into small cubes. For the stock: Fry the prawn heads in a little hot oil until they start to change colour, then add the stock and bring to the boil. Simmer for 10 minutes and then remove from the heat. Strain the stock and use to make the risotto. In the meantime, heat some oil in a large pan and add the shallot. Cook for 5 minutes until soft and add the garlic, then cook for a further 30 seconds. Add the rice and cook for 1 minute until transluscent. Add the wine and stir until the wine is absorbed by the rice. Start adding the stock ladle by ladle whilst constantly stirring the risotto. Add the diced courgettes after 5 minutes of cooking. Once the risotto is nearly cooked add the prawns and any remaining stock. Stir until the risotto rice is al dente. .
Stir in the butter the shredded basil and add the parmesan cheese. Season with a few pinches of salt and pepper to taste. Serve immediately with the strips of crisp pancetta.